Doug Christie's Canadian Free Speech League stands for freedom of speech! On October 28th, 2009, they applied for Intervenor status in the Lemire case, which is a Constitutional Challenge of the internet censorship powers held by the out of control Canadian Human Rights Commission. 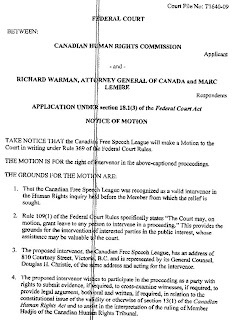 The CHRC is seeking a judicial review of the stunning decision of the Canadian Human Rights Tribunal in the Lemire case, which found Section 13 and 54 of the Canadian Human Rights Act to be a violation of the freedom of speech rights of all Canadians.